RICHMOND, Va. -- Dozens of women packed into the state Capitol Thursday to stand beside Gov. Ralph Northam, Attorney General Mark Herring and General Assembly members who issued a statement in solidarity with women’s reproductive rights. Representatives of several advocacy groups, including the National Abortion and Reproductive Rights Action League, joined public officials, all Democrats, to discuss abortion rights and promote better access to comprehensive reproductive health care. Meanwhile, two bills calling for greater reproductive health rights failed to leave the Senate Committee on Education and Health. Committee members voted 8-7 twice, along party lines, not to advance the bills. Public officials and advocates who support abortion rights promised to remember Thursday’s votes at the next election. “When we can’t change people’s minds, we change seats,” Northam said. Boysko expressed concerns that the current political climate could jeopardize women’s reproductive rights. SB 1451, sponsored by Sen. Jennifer McClellan, D-Richmond, also failed in committee. The bill would have eliminated the state’s requirements women get an ultrasound before an abortion, that a second trimester abortion must be performed in a hospital and that two doctors are needed to certify a third-trimester abortion. “It’s time we stop criminalizing a woman’s choice and expand access to care for all Virginians,” McClellan said. When McClellan served in the House of Delegates, she was the first member to give birth while in office. She said pregnancy opened her eyes to the scope of women affected by current regulations and prompted her to submit her bill. HB 2491, sponsored by Del. Kathy Tran, D-Springfield, is identical to McClellan’s bill and currently sits in the House Courts of Justice committee. Tran said the current medical requirements are unnecessary and impact low-income Virginians and women of color. RICHMOND — In a break from past years, some large energy-related political donors gave more money to Virginia Democrats than to Republicans in 2018, according to campaign finance reports posted Friday by the Virginia Public Access Project. 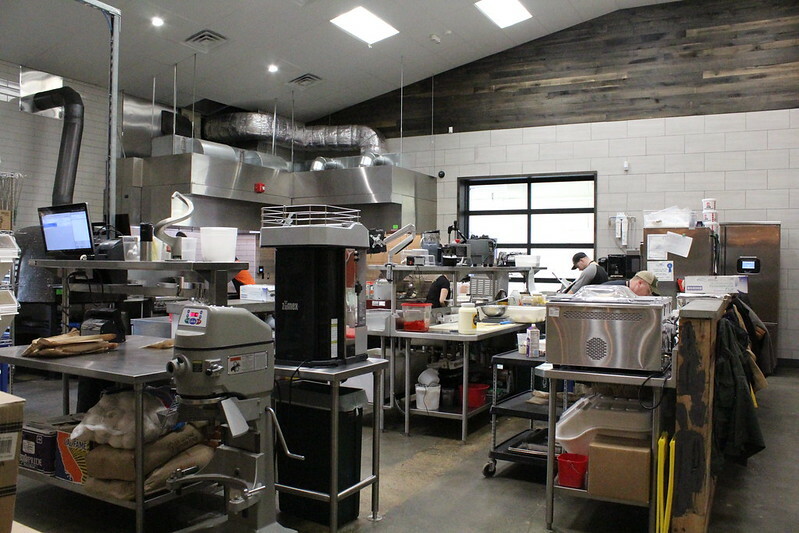 RICHMOND — A renovated diesel engine repair shop is home to a new food concept in Scott’s Addition. The Big Kitchen opened its takeout and delivery-based business on Wednesday, with the vision of creating meals from scratch that people can enjoy at home. RICHMOND — The Virginia Poor People’s Campaign, a revival of the Rev. Martin Luther King Jr.’s 1968 campaign to tackle poverty, gathered Wednesday at the Capitol, urging state and federal lawmakers to expand voting rights, raise the minimum wage, promote renewable energy and curb military aggression. HB 1902, sponsored by Del. Sam Rasoul, D-Roanoke, promotes renewable energy. It would make “$1 billion in grants available over three years to religious institutions, public schools, institutions of higher education, and localities” to help finance the installation and operation of solar energy systems, according to a summary by the Legislative Information System. HB 1651, sponsored by Del. Cliff Hayes, D-Chesapeake, would raise from $500 to $750 the threshold for a theft to be considered grand larceny. SB 1200, sponsored by Del. Rosalyn Dance, D-Petersburg, would raise the minimum wage to $15 an hour by 2021. RICHMOND — A Senate bill to designate Election Day as a state holiday in Virginia is dead for this legislative session. On a 5-7 vote Monday, the Senate Committee on General Laws and Technology defeated SB 1291, which also would have removed Lee-Jackson Day as a state holiday so that the number of holidays would stay the same. Sen. Louise Lucas, D-Portsmouth, sponsored the bill seeking to make Election Day — the Tuesday after the first Monday in November — a state holiday. In November, voters in Chesterfield County said they waited more than two hours in line to vote — a situation that occurred throughout the nation. Research shows that the U.S. has lower voter turnout than most developed countries — many of which hold elections on weekends or designate the day as a national holiday. In Virginia in November, voter turnout was below 60 percent. “This legislation will help protect and expand the right to vote,” Lucas said. Asif Bhavnagri, Gov. Ralph Northam’s assistant secretary of administration, said the administration supports the bill. There were no comments from the public in opposition to the bill. Sen. Frank Ruff, R-Clarksville, who chairs the committee, questioned why Lucas proposed removing Lee-Jackson Day as a state holiday. That holiday, which marks the birthdays of Confederate Gens. Robert E. Lee and Thomas J. “Stonewall” Jackson, is observed on the Friday immediately before Martin Luther King Jr. Day (the third Monday in January). “People who are used to getting four-day holidays that particular weekend, with Lee-Jackson on a Friday and King on Monday — don’t you think they would be a little upset?” Ruff asked. Sen. Richard Black, R-Loudoun, also voiced concerns about removing Lee-Jackson Day as a holiday. Lee-Jackson Day is observed only in Virginia. Various localities, including Richmond, Charlottesville, Fairfax and Norfolk, do not observe the holiday. Lucas’ bill is not the only legislative attempt to declare Election Day as a holiday. In the House of Delegates, Del. Joseph Lindsey, D-Norfolk, has filed a similar proposal – HB 1984. It is awaiting action by a House subcommittee. In 2016, Donald McEachin — then a state senator and now a member of Congress — also introduced a bill to designate Election Day as a holiday instead of Lee-Jackson Day. The Senate General Laws and Technology Committee defeated McEachin’s bill on a 7-8 vote, with seven Democrats in favor of the bill and eight Republicans opposed to it. Six of those Republican senators, with the addition of Sen. Siobhan Dunnavant, R-Henrico, voted against Lucas’ bill Monday afternoon, while five of the same Democratic senators — once again — voted for it. Here is how the Senate General Laws and Technology Committee voted Monday on SB 1291 (Legal holidays; Election Day). YEAS — Locke, Barker, Ebbin, Surovell, McPike — 5. NAYS — Ruff, Vogel, Black, Reeves, DeSteph, Suetterlein, Dunnavant — 7. RICHMOND, Va. — Legislation introduced by Del. Robert Thomas, R-Stafford, would expand autism insurance coverage to nearly 10,000 Virginians and lift the cap that excludes those over the age of 10.